Time was when Marie Cavanaugh spent hours in her South Dakota farmhouse each Christmas season making pecan rolls and homemade chocolates for holiday gifting. "It started when my aunt sent her pecan-rolls recipe," Mrs. Cavanaugh recalled. "I gave the recipe my own touch and started making the yummy specialties. Then I began dipping chocolates. Our friends and neighbors loved these treats, encouraging me to start a candy business. Finally, I decided it might be a good idea.'" Her husband George and children Carla, Lorraine, Calvin, Colene and Genise rallied, helping Mrs. Cavanaugh fill demands for her homemade sweets. ...In 1972, the family moved to Utah, leaving good friends and their beloved cattle ranch. "It was a difficult decision, especially for George," Mrs. Cavanaugh said. "He was excited about making our new venture, which we chose to call Mrs. Cavanaugh's Candies, a great success. We felt Utah was blessed with good chocolates and that we would enjoy - and could compete with - those who pride themselves on making excellent chocolates." 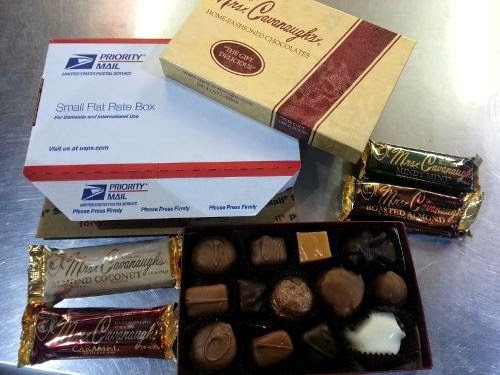 I received this package for review~ These Chocolates were awesome! Well the few pieces I got were great! The kiddos discovered the chocolate bars and ate them up... The kids gave them a 5 stars.